Dazed & Confused has an archive stretching forward 21 years from the simple black and white folded poster which was its launch issue. This extensive archive of 189 issues (+ 3 supplements), 33,500 pages, approximately 12 million words, has now been completely databased by Exact Editions and is available to magazine subscribers — a free and fully searchable resource for all print and digital subscribers. The Dazed & Confused archive as it grows will be a rich resource for students of fashion, innovation and design for many years to come. Searches across the whole archive can be filtered for ‘earliest’ or ‘latest’ instances/occurrences. As the magazine has evolved it has interviewed, portrayed and published the work of many twenty-first century cultural icons: Kate Moss, Rankin, Thom Yorke, Jarvis Cocker, Eminem, and James Lovelock. As well as being a cultural treasure-chest the Dazed archive also allows us to track the evolution of magazine design and technology; the gradual flirtation, romance and embrace of digital media. The digital version of the magazine as it emerges through the archive shows how the leading style magazines have become steadily and inevitably more digital through the rising tide of the internet. As it happens the first issue of Dazed appeared shortly after Tim Berners-Lee invented HTML and the web. The web was two years old when Dazed was born. But Dazed was fully graphic from the kick-off, and it would be a few years before the web would seem like a plausible medium for fashion and design. The first mention of Google in the magazine comes in issue 79, the first mention of Facebook in July 2007, and the first hint of Twitter in May 2009 (only 53 hits so far). The early numbers of the magazine show us how highly visual and design-rich magazines were presented before the advent of digital and web technologies. Of course we find phone numbers and fax numbers (remember them?) in the earliest issues but the very first email address pops up in issue 18. 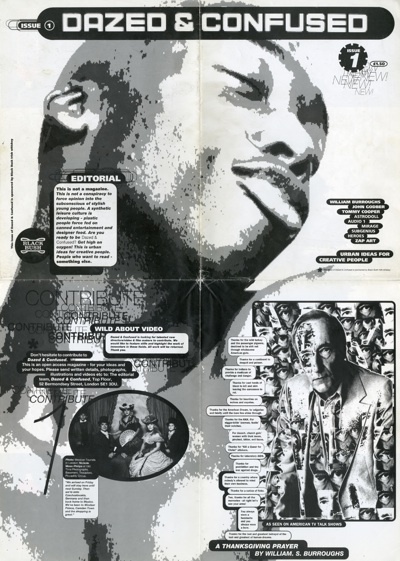 The first web site is referenced in issue 11, March 1996: a link to Dazed’s own early web site. By September 2000 the magazine has a good sprinkling of web references and most of the contributors are listed with email addresses. The next decade sees a steady growth in the digital development of the Dazed brand. Both through the launch of a cutting edge web site — Dazed Digital which was set up in 2006 — and through the cultivation of web links, especially in the stylish adverts and in the use of email and other digital links in the body of the articles. Dazed was one of the first magazines to use the Exact Editions digital platform, another of their deft digital moves in 2006! Exact Editions gave them a fully searchable database and a pure web solution which eschewed the seductive but ultimately sterile attractions of Flash. Dazed has always been a magazine that its audience reads as well as being rich and inventive in its imagery and portraiture. How have links grown in Dazed & Confused? In a typical issue, December 2011, there are 180 phone numbers (clickable to call if you are looking at your subscription to Dazed with the Exactly iOS app on an iPhone), only 5 post codes (but they will click you through to the appropriate Google map), 131 web addresses (mostly the great fashion brands that advertise in the magazine), and 65 email addresses. Digital magazines have a lot of potential for user interaction when they have on average 2 or 3 links per page. Every link in a magazine has potential for direct engagement with the user/reader. We can be confident that in the next five years the link-ability of magazines will become an even more important issue. For magazines such as Dazed & Confused that have deep and rich archives, the ability to link to every page and from every page will become stock in trade for the digital magazine audience.